This tour to these beautiful islands 450 kilometres off the coast of West Africa will concentrate on locating the five endemic species – Cape Verde Sparrow, Cape Verde Buzzard, Alexander’s Swift, Cape Verde Swamp-warbler and Razo Skylark – and several endemic sub-species, plus Red-billed Tropicbird and other seabirds and extralimital Western Palearctic birds including Grey-headed Kingfisher and Black-crowned Sparrow-lark. Day 1 We will leave London in the morning on a direct flight to Boa Vista. Arriving in the early afternoon we will catch an internal flight to Santiago, where we will check into our comfortable hotel for a three-night stay. 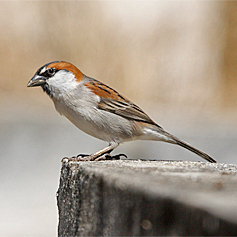 If time permits, we will birdwatch locally and may see our first endemic bird, Cape Verde Sparrow. Three nights on Santiago. Days 2–3 We will have two days to explore the island and search for three more endemic species: Cape Verde Buzzard, Cape Verde Swift and Cape Verde Swamp-warbler. Although the number of species on the islands is relatively small, there are several endemic sub-species that may be given specific status in the future and we will look for them all. At the top of the list will be the critically-endangered "Bourne's Heron" (Purple Heron). This heron has evolved a rather strange feeding strategy, spending much of its time hunting on rocky mountain slopes rather than in marshes and reedbeds. We will also visit a small reservoir where, on our previous tour, we found a Black-headed Heron and where there have been recent records of Black Heron and Intermediate Egret. Additionally, we will search for alexandri Eurasian Kestrel, a possible split into Alexander's Kestrel, the endemic Cape Verde Buzzard, the rare and endangered madens rae of Peregrine Falcon, known as Cape Verde Falcon and a possible split from Peregrine Falcon, and, in the evening, detorta Barn Owl, a possible split into Cape Verde Owl. Other birds we will look for include Grey-headed Kingfisher, which occurs nowhere else in the Western Palearctic, Helmeted Guineafowl, which although introduced, is well-established and cannot now be found anywhere else in the Western Palearctic, and another established introduction, Common Waxbill. We will also visit a coastal site where there is a colony of Red-billed Tropicbirds, a species that cannot be found reliably anywhere else in the Western Palearctic. Further birds we may see include Rock Pigeon of the atlantis race, Spectacled Warbler, Blackcap, Brown-necked Raven and Spanish Sparrow. Day 4 Early in the morning we will return to the airport for our flight to Sao Nicolao via Sal, arriving at our guesthouse in time for lunch. Afterwards we will explore the island looking for neglectus Eurasian Kestrel, a possible split into Neglected Kestrel, and have another chance to see Helmeted Guineafowl, which is quite common here. We will spend much of the afternoon birding around the harbour and nearby coastline, where we may see our first Brown Boobies and Cape Verde Shearwaters. In the evening we will visit a nearby site to look again for the endemic sub-species of Barn Owl. Two nights on Sao Nicolau. Day 5 Today will be special as we take a two-hour boat trip to the remote and inhospitable Razo Island, home of the endemic Razo Skylark. Just 2.5 square kilometres in size, Razo has a small population of around 100–150 larks; the species therefore has one of the smallest ranges of any bird in the world. We are not permitted to land but we can get very good views of these enigmatic larks from close inshore. Many seabirds breed on the island and, while several species come ashore only at night, we are sure to see most of them on the return boat-trip and off Razo itself. Brown Boobies and Red-billed Tropicbirds are diurnal and easy to see but some of the shearwaters and petrels are nocturnal in their landings. Nevertheless, we should get good views of Cape Verde Shearwater, Boyd's Shearwater and Fea's Petrels. We will also have some chance of seeing both Madeiran and White-faced Storm-petrels, although both species come ashore only at night and spend the daylight hours far out at sea. Day 6 After some early-morning birding around the harbour, we will head back to the airport for a flight to Sal. Although there are no speciality birds here, we will check a number of sites on the island, including the saltpans, for vagrant herons, waders and passerines. Overnight on Sal. Day 7 We will return to the airport and catch a flight to Boa Vista. After checking into our hotel, we will head to the southernmost point of the island across arid stony deserts and sand dunes. Eventually we will reach a viewpoint where we can scan an offshore islet with a breeding colony of Brown Boobies. In amongst the boobies, the last breeding pair of Magnificent Frigatebirds in the Western Palearctic can be found. Returning through the desert, we will look for Cream-coloured Courser, Greater Hoopoe-lark, Black-crowned Sparrow-lark and Bar-tailed Lark. We will arrive back in 'town' in plenty of time for those who wish to be taken by zodiac to a small islet where both Madeiran and White-faced Storm-petrels breed. You will need to wade ashore and spend the night in sleeping bags but it is a unique experience. Those who do not wish to do this can stay overnight in a hotel on Boa Vista. Day 8 While we are waiting for those who chose to spend the night on the islet to return, we will bird around the edge of the desert again. If we missed the frigatebird the previous day, we will have the option to return to the site. After lunch we will go to the airport to catch our afternoon flight back to London, arriving late in the evening. General Information The climate can vary from quite cold in the mornings and on the coast to hot in the interior. The pace is moderate and only a limited degree of fitness is required except for landing on the islet for storm-petrels. Accommodation ranges from medium-standard hotels with en-suite facilities where available to bed and breakfast guesthouses. Transport is by minibus or four-wheel drive but some of the roads can be very bumpy and dusty. Visas are required and can be purchased locally. Group Size Minimum number for tour to go ahead: 8; maximum group size: 14 with 2 leaders. Price includes direct return flights between London Gatwick and Boa Vista and internally in the Cape Verde Islands, all ground transport on the islands, boat trips, accommodation in twin-bedded rooms with private facilities where available, breakfasts and dinners and all guiding services. Excluded are insurance, visas, lunches, drinks, gratuities and items of a purely personal nature.